Timberman (Free) by Pawel Jedrysiak seems to be the newest hot thing in iOS games. 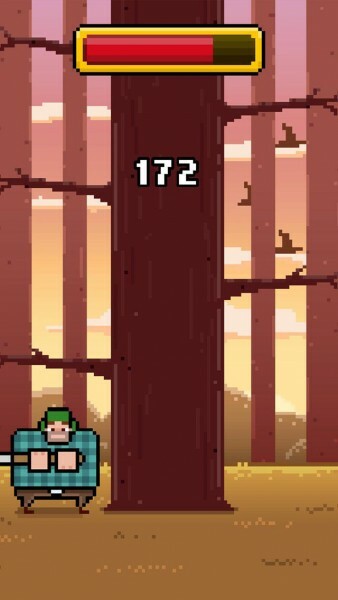 If you enjoyed simplistic, but frantic and challenging little arcade games similar in the vein of Flappy Bird and the like, then you will enjoy Timberman. 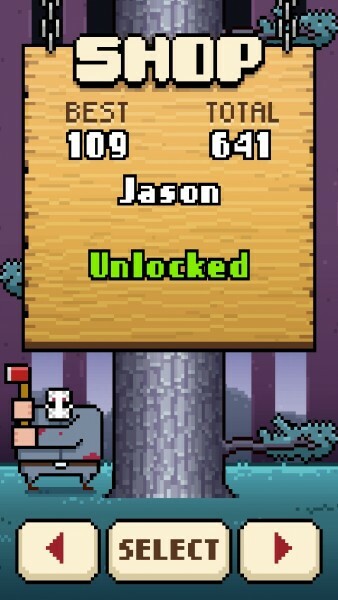 Just how much wood can you axe? I’m online a lot, and I always read about apps and talk with other people online on sites like Twitter about apps. It’s kind of part of my job, you know? 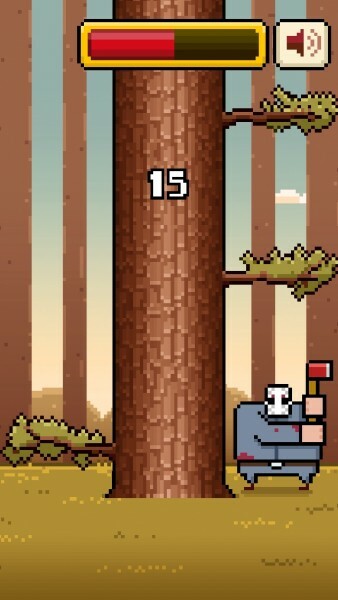 So of course I always notice the latest trends in mobile apps and games, and I’ve spotted a new one: Timberman. I’m not a huge fan of things like Flappy Bird, truth be told. I remember I downloaded that game, got a high score of five, and was done with it forever. 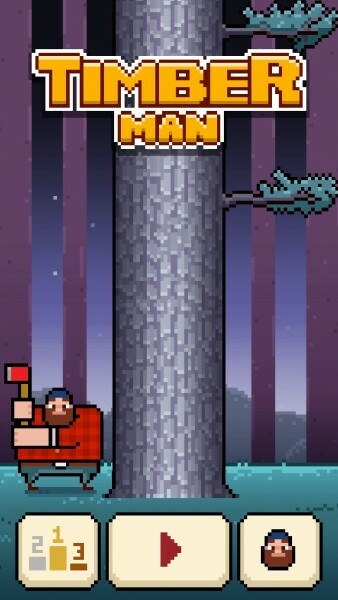 So when I saw Timberman in the App Store, I kind of just looked at it, saw that it was one of those simple little touch games, and kind of shrugged. But then I saw that everyone seemed to be talking about it, or at least it was getting some press coverage. I thought to myself, “Why?” So I downloaded it and gave it a try for myself. “Hey, it’s not that bad,” I thought. 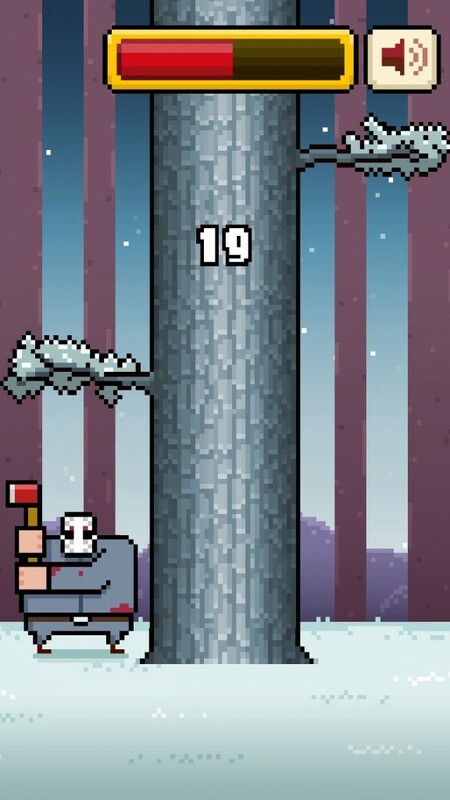 Timberman features a retro, pixelated look and feel to it, which is similar to Flappy Bird, and other 16-bit games. This is definitely not a bad thing, at least for me, because I rather enjoy this specific type of art style. 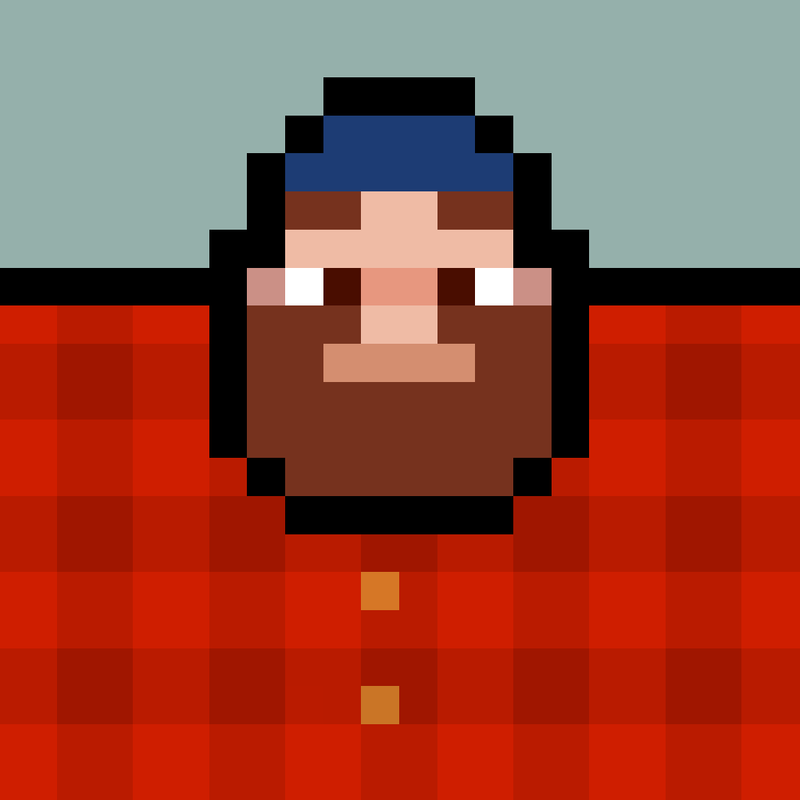 Everything looks pretty good in this game, from the giant tree you’re endlessly chopping down, to your bulky lumberjack character, as well as the four variable environments you will find yourself in for each round. 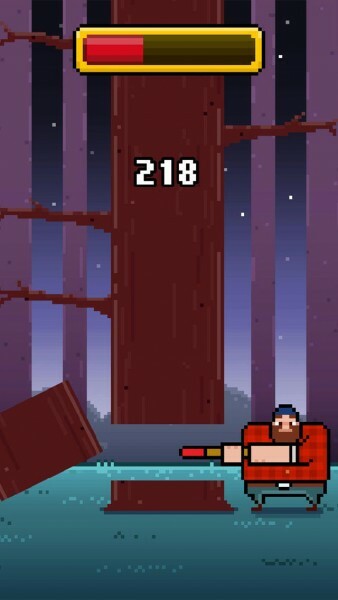 The animations in Timberman are also quite smooth and fluid, which is great, considering the fast-paced nature of the game itself. 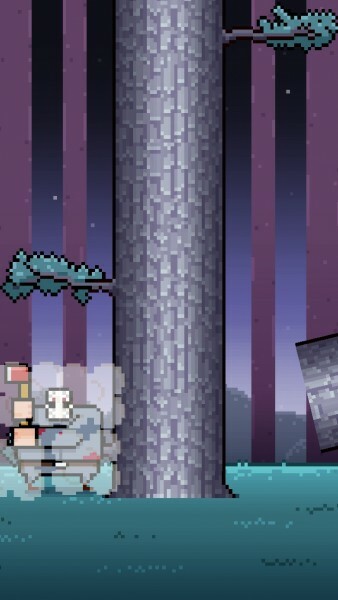 There’s a chiptune soundtrack that you can listen to as you play, as well as quirky chopping sounds as you cut that tree down to size. 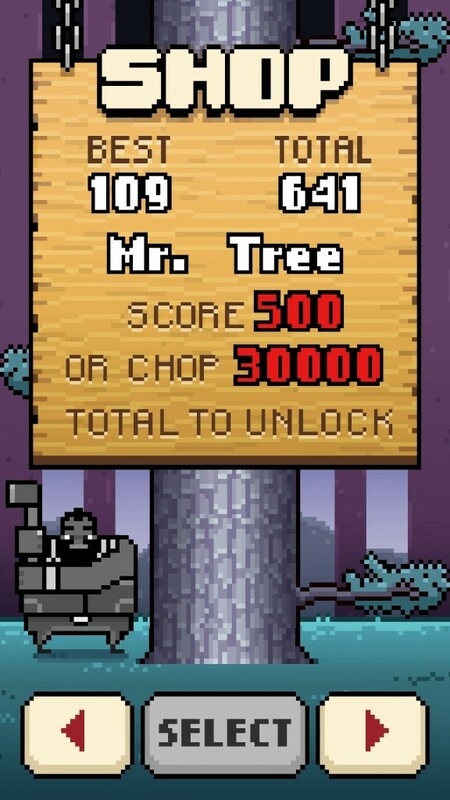 There’s only one game mode in Timberman, but that’s all you need for now. Basically, the point of the game is to chop that tree down, while watching out for those pesky branches that will come down on either side. When they are above you, you’ll want to make sure that you’re on the other side to chop. The one-touch controls are simple, and make it possible to play the entire game with one hand, though I personally found it easier to use both hands, since there’s one other twist. Basically, you just tap on the side of the screen that you want to be on and chop from. There is also support for some MFi controllers. You may think that you can leisurely take your time chopping that tree down, so it looks relaxing at first. And then I realized I was dying even though I wasn’t hit by a branch. Then it hit me — the game is timed. You will only have a certain amount of time to clear the “level” that you’re on, before you can move on to the next level, which means less time on the clock and more branches to deal with. The game ends if you are either hit by a branch or time runs out. Your score is determined by the number of times you were successfully able to chop the tree. 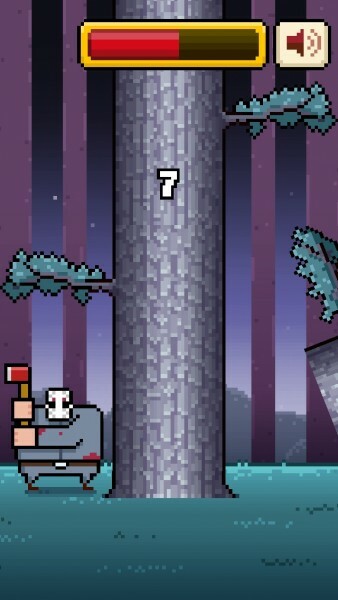 In this aspect, I found the game to be much better on the difficulty scale than something like Flappy Bird. 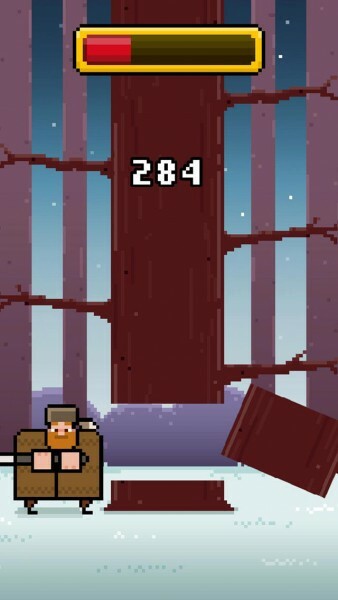 In addition to simple gameplay, you can unlock different Timberman (even a Timbergirl) by scoring a certain number of points in a single game or getting a total number of wood chunks through playing. These are nothing more than cosmetic rewards, as they don’t change the gameplay in any shape or form. Like any of these simple little games, it’s always about competition with friends and global strangers. That’s why there is full Game Center integration for leaderboards (Top Score and Total Chunks), as well as 22 achievements to obtain. If the straightforward and frantic gameplay doesn’t keep you coming back, perhaps the competition will. Since this is the free version, you will have to deal with an ad every now and then, but they pop up after every few rounds, so it’s not that bad. 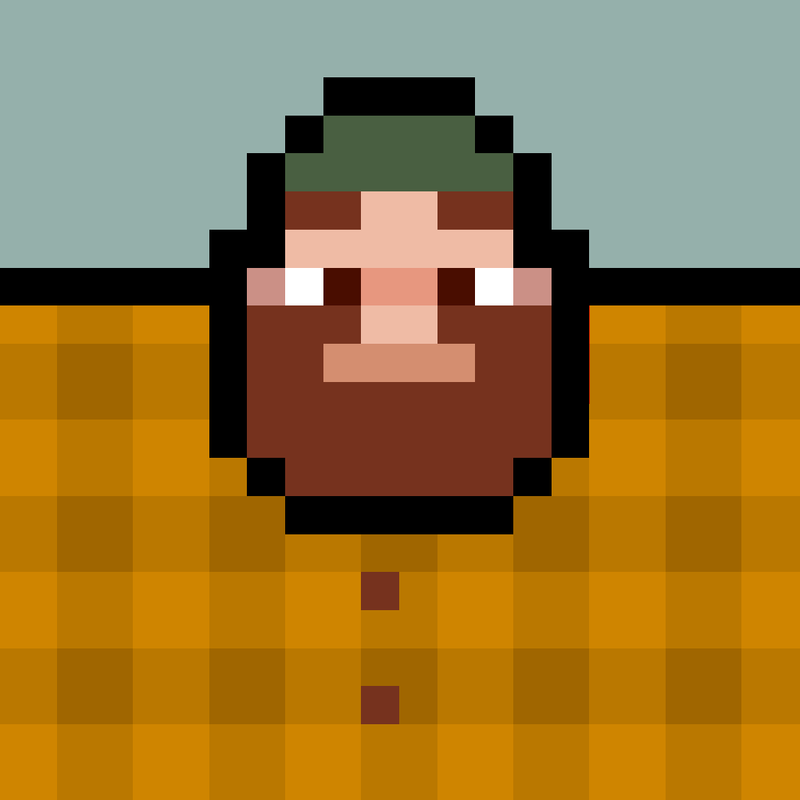 You can pay $0.99 for the “Golden Edition” of Timberman, if you prefer not to be bothered with any ads. I’m pretty sure that the repetition of this game will get boring for me after a while, but for now, I’ll just ride the wave like everyone else. 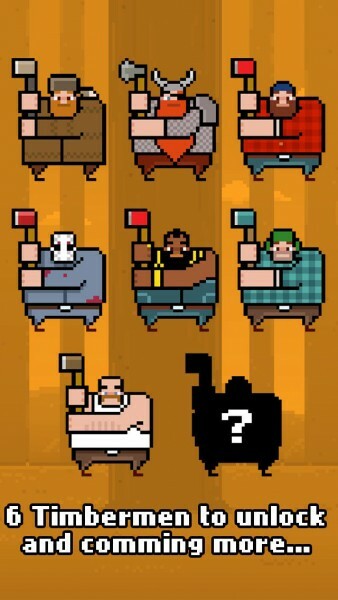 It’s a chopping frenzy with some great retro graphics and cosmetic unlockables to look forward to, and the competition is fun. It’s just a fun and silly way to pass some time, and I’m okay with that. 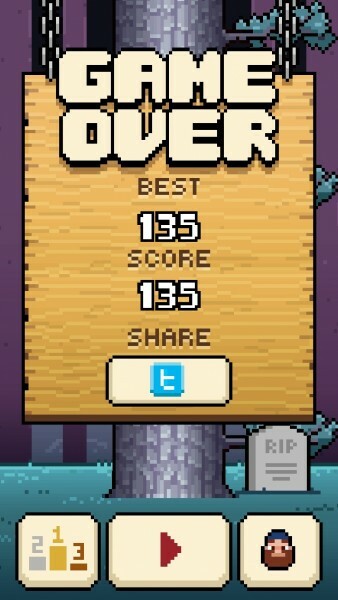 I recommend trying out Timberman if you haven’t already. It’s a free download, and while it doesn’t provide the most engaging gameplay of all time, it’s still just a harmless way to pass the time. 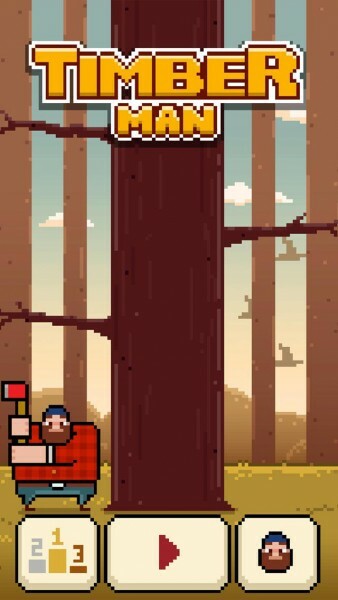 You can find Timberman on the App Store for free, or grab Timberman Golden Edition for $0.99 for an ad-free experience.